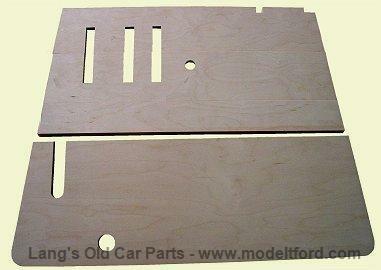 Model T Ford Forum: 26 27 Roadster Floor Board Dimension? 26 27 Roadster Floor Board Dimension? 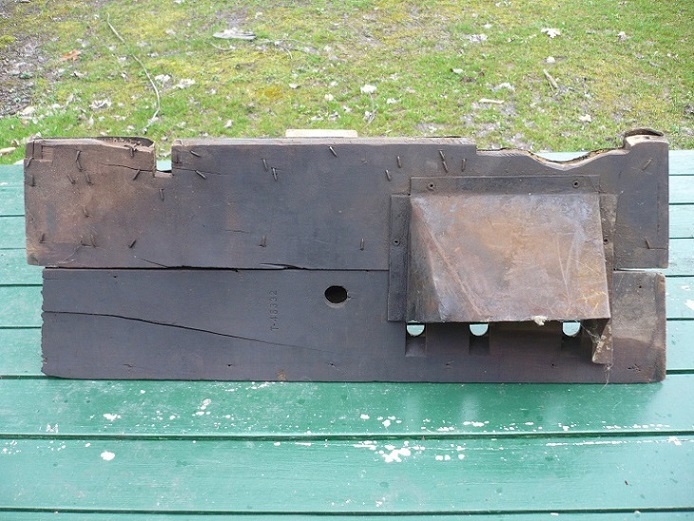 Model T Ford Forum: Forum 2013: 26 27 Roadster Floor Board Dimension? Can anyone say what the horizontal floor board over all width is supposed to be on a 26 27 open car? I have a set of plans but there are some gross errors in them and I don't trust them. The plan shows that the horizontal floor board is 11-7/8" wide. To get the joint to match correctly between the horizontal floor board and the sloping board is seems that the horizontal broad should be about 11-1/4" wide. I have not made the final angle cut on the lower sloping board yet and the flat board is now 11-7/8" wide. I believe #3 and #4 were originally held as one piece with metal straps, this allows the parking brake slot to be continuous in those two pieces. Here are photos of the ones in my 26 Tudor. 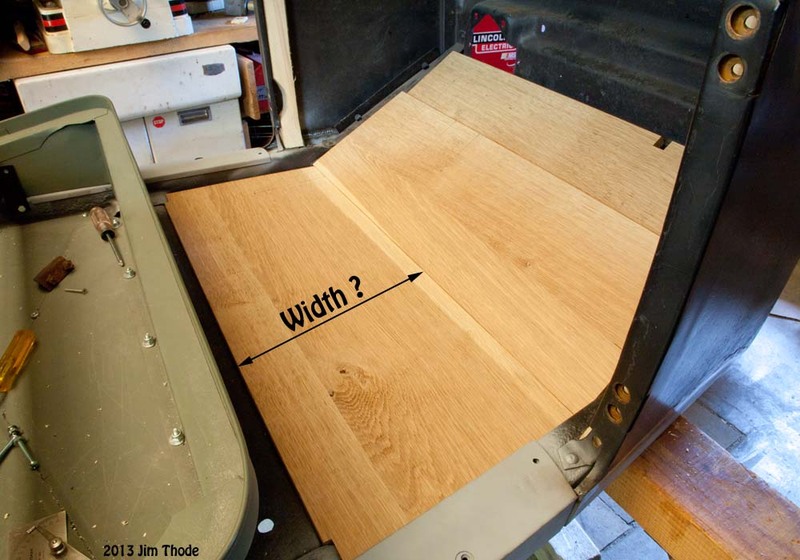 Are Tudor and Roadster floorboards the same? On these the dimension you are asking for varies from 11- 7/16 to 11-11/16. I need to make a set for my 26 Roadster also so a set of good plans would be nice. At least you can see how they are fastened together. The 11-1/4" dimension sounds about right. The board you have marked #3 should have a half lap joint between it and the one marked #2. The #2 board fits under the #3 as the #3 holds the #2 in place. Just to be picky - the boards marked #3 and #4 are actually the #3 upper and #3 lower. Together they make the #3 floor board assembly. The #3 upper board in the photo Dale posted should not have the notch for the handbrake in it. 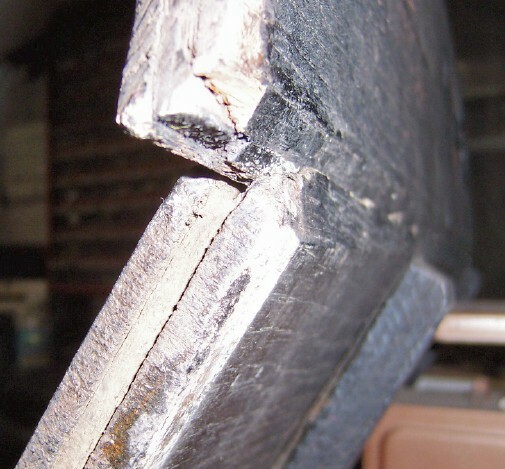 The earlier floor boards had this notch as the hand brake plate extended up this board. 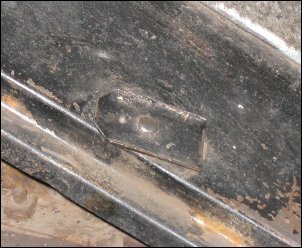 The 26-27 cars used a shorter hand brake plate. 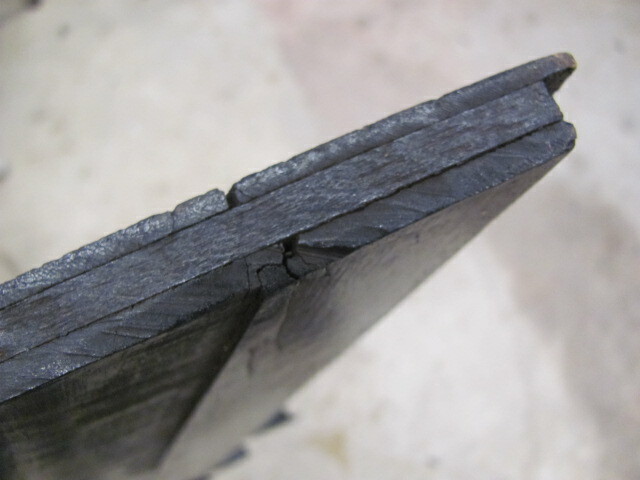 The hole is only on the bottom board, and the edge of the plate is bent up to clear the upper board. Also, the back corners of the bottom board should be rounded, and the back side of those corners are beveled and there should be a 1/4" thick x 3/4" wide spline glued in the center of the edge of each board. I see that Lang's sells the metal strap for holding the #3 and #4 board together but say it is only for closed cars and trucks. I wonder is anything is used to hold them together in open cars. They do show that for roadster and touring cars that #3 and #4 are separate boards and that #2 and #3 are one board. 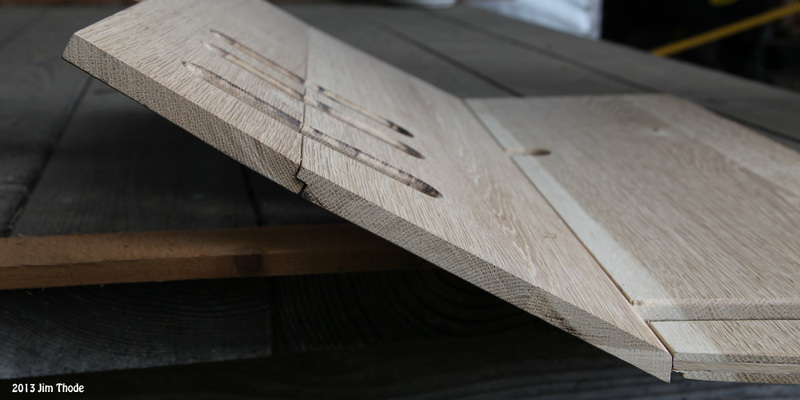 The spline along the ends would would prevent the board from separating if they split but would also guarantee that they would split due to changes in humidity. Standard woodworking practice is to allow for expansion and contraction across grain but a glued spline would not allow for the normal and sometime quite great changes in width. The 26-27 roadster and touring also used those brackets. The earlier ones did not. The photo in the catalog have the pieces placed together. There are actually 4 pieces of wood - #1, #2, #3 upper and #3 lower. There is a half lap joint between the #1 and #2, and the #2 and #3 upper. There is a bevel between the #3 upper and #3 lower, they are butted together and held together with the three brackets. It's semantics what you call them but the Tudor uses those same floor boards and on the Tudor the #4 floor board is the one under the front seat, and the #5 is the rear floor board. I agree that normally you don't want to glue in a spline across the grain due to the expansion/contraction of the wood. However, the documentation clearly states that the splines are to be there, they are to be 1 piece and they are to be glued in place. One more little detail - the cleats on the bottom should be nailed in place and then the ends of the nails clinched over on the bottom of the cleat. It looks really crude, but that is the way it is specified to be done. So the wood cleats on the bottom are an original feature too. I have seen some with a wind deflector under the pedal area. 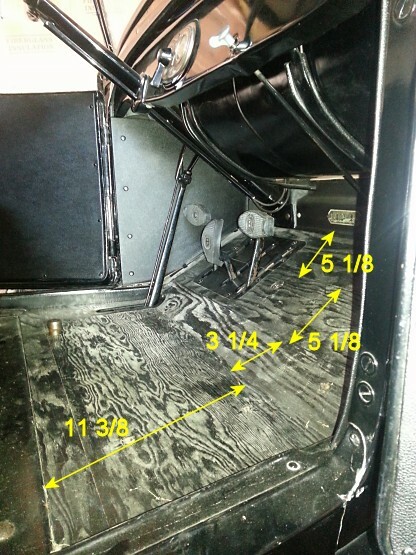 Does anyone know if the 26/27 floor boards had a metal wind deflector installed underneath the pedal area? Yes. The wind deflector (draft shield) was introduced during the 1925 model year and continued through 1927. The 25 shield was smaller as the pedal spacing is narrower. The shield is riveted to the bottom of the #1 floor board with the rivets going through the holes in the pedal plate and are peened over on the bottom side. David, thank you for the information. 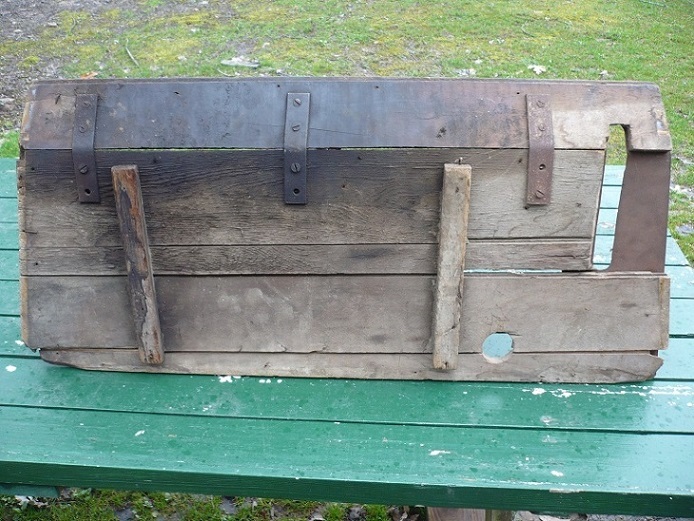 Arnie, here is a photo of the top 2 boards from my Tudor showing the wind deflector. Jim, When you get your floorboards to fit properly I would certainly appreciate some measurements. It looks like mine would not be suitable for a pattern. The T-45332 is the factory drawing number for this floorboard. The "improved car" bodies for 1926-27 were an all new design for the Model T. Special ranges of factory drawing numbers were set up for these bodies above about #15,000 up to 50,000. Drawings for the body parts, including the floor boards, for these cars can be found in the collections of the Benson Ford Research Center at The Henry Ford in Dearborn, MI. 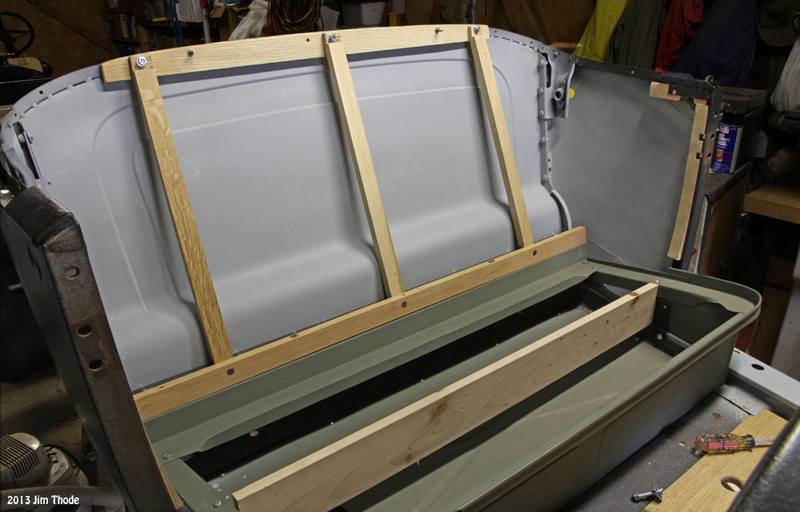 In addition to the parts drawings, there is also a very complete collection of "Process Sheets" for these bodies and parts that describes in great detail how to build, paint and upholster the bodies (Acc. 166). Finally, the floor boards were indeed painted with a material the Ford engineers referred to as M-142 Black Slush. It has a very simple formula, half paint thinner and half gilsonite. This same paint was also used on Model T engines from the late teens up to mid-1925. With the introduction of the "Improved Cars" in August 1925, motors began to be painted in "Moleskin Motor Pyroxolin". Hap, is it possible to order drawing # T-45332 from the Benson Ford Research Center? That number is visible in the last photo I posted in the bottom board just left of the finger hole. I just measured and took a picture of the floor boards on my 1927 Roadster. 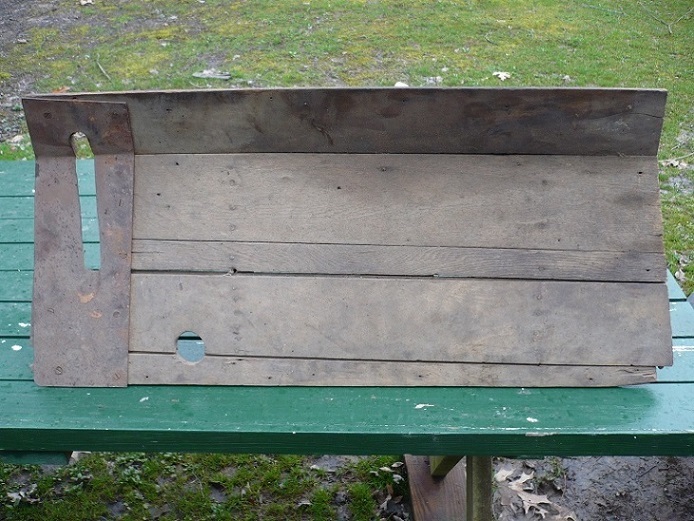 The bottom board is 11 3/8 inches front to back, and is notched to allow the operation of the hand brake, as well as for the starter button. The next board up is 3 1/4 inches, and is notched at the bottom for the hand brake. 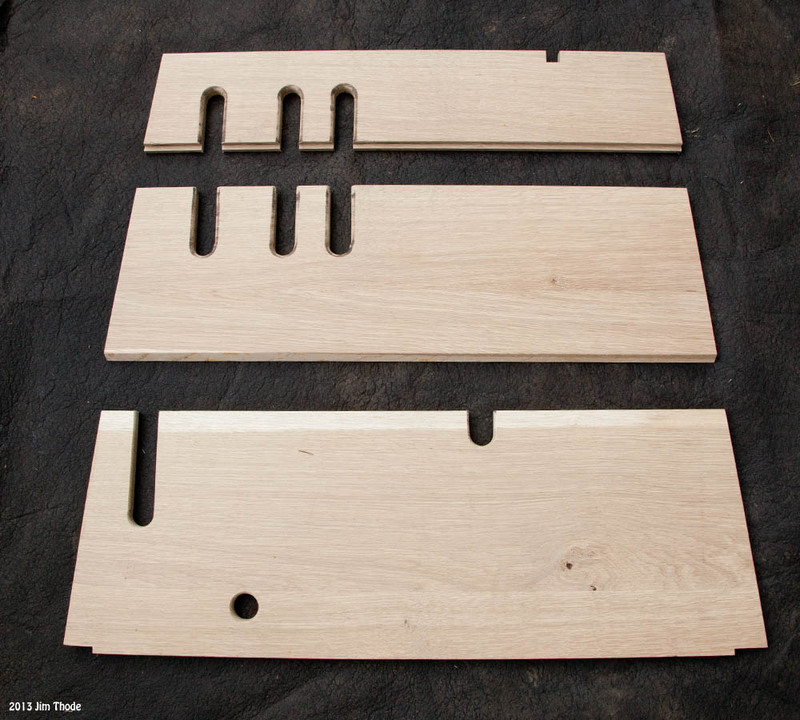 The next two boards are 5 1/8 inches front to back, and are notched for the pedals. They are screwed down, but I don't recall that they had any brackets underneath. Another interesting thing about the improved model floor boards is that some have the slanted boards held in place by a tab that rotates on a rivet on each side of the vehicle. John mentions that his are "screwed down" so perhaps another configuration exists! I believe my vehicle is an early 1926 and does not appear to have any hold downs for the floorboards! I have seen many other vehicles without floorboard "hold downs", and also some with the rotating tabs. I never was able to get positive proof, but my guess is that Henry Ford used the swinging tabs later in production. But do not hold me to it as it is only a guess on my part without documentation. I never found the swinging tabs listed separately in any parts book! P.S. 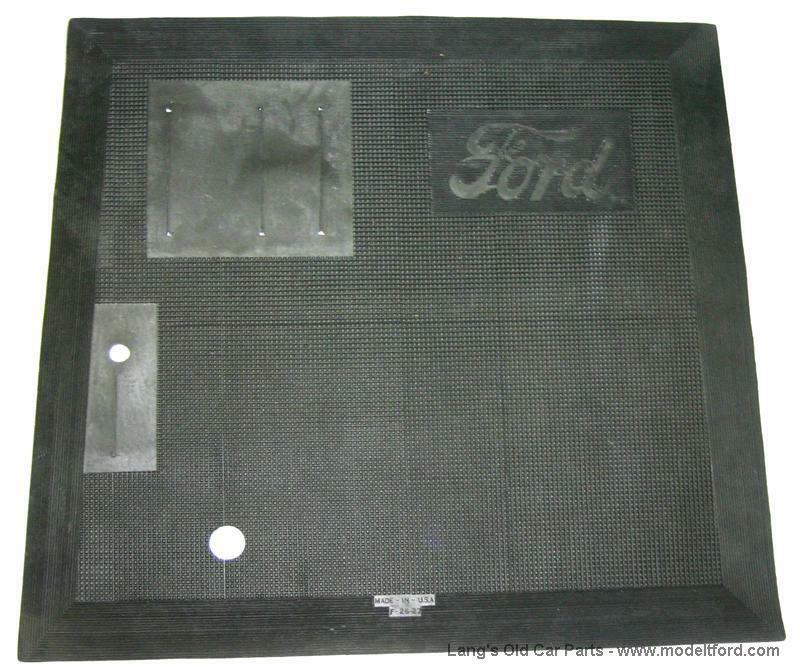 Soon you will have more information than you really wanted about improved Ford floorboards! Sorry, I was wrong! 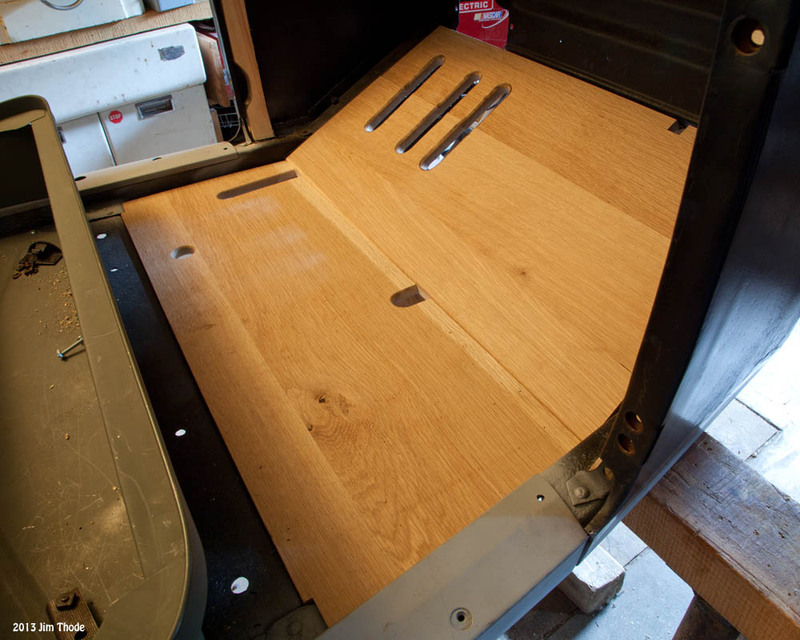 My 1927 roadster floorboards are not screwed down. It is my 1926 depot hack that has the screwed-down floor boards. Here is another thread about the floor board hold downs. Early 26 did not have hold downs but later ones did. 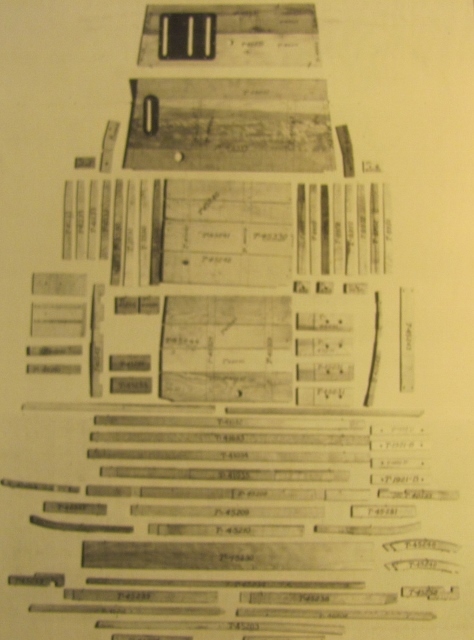 Came across this photo of new Ford sedan wood parts, caption of picture says over 70 wood parts in the 1926 Ford. Here is a close up of the '26-'27 Sedan front floorboards, construction and the factory numbers of each wood piece. 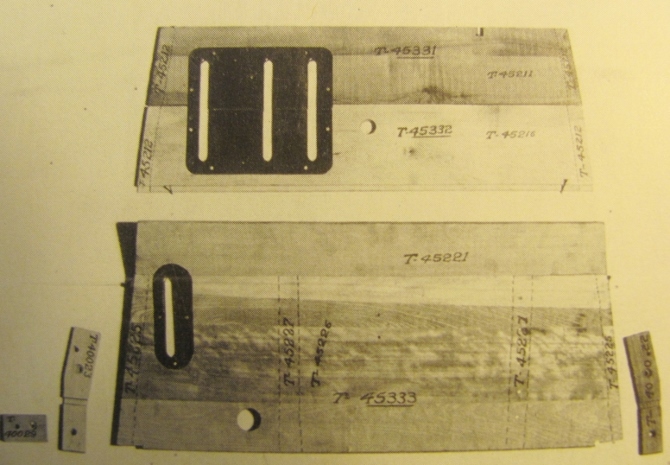 Note the stringers underside, and the composite construction. This photo should put away the myth that floorboards came from packing crates made to specs by Ford to be used as floorboards! And this is close up of the smaller pieces of wood inserted into the kerfs of the long pieces at each end to give the boards strength. You can see the part numbers for these end pieces in the labeled photo. Step cuts for the bevel between adjoining boards. Thank you Dan and John. Ref you question: "... is it possible to order drawing # T-45332 from the Benson Ford Research Center? That number is visible in the last photo I posted in the bottom board just left of the finger hole." Yes, it is highly likely they have that drawing available. I have not had time to check factory numbers to verify the T-45332 is or is not the factory number for the 1926-27 floorboard. I would guess that it is -- but the factory number is normally listed in the Price List of Parts so we do not need to guess. I'll try to check tomorrow and include that with the ordering information. Or if you are in a hurry � just Google the Benson Ford Archives and look for the tab about long distance research or something similar. They are helpful � but it quickly gets out of my price range for ordering the factory drawings, photos, etc. If you go visit � it is free to take photos of many of the items. Great place and very worth while for us to support. All � great information! Thank you all! Thank you. I'll follow thru with BFRC. Anytime I make floor boards for a 26-27 I make the rear board slightly longer. Then the pedal boards (I only use two) are given a half lap joint between the two and I make a birdmouth cut on the lower board where it meets up with the rear board. If you have Mel Miller plans they have some issues I just found out. The seat back parts on the 26-27 roadster are not per the drawing. The upright (piece C) is incorrect. On my Mel Miller plans the the "C" back boards seemed to be correct. Other then then the replacement back metal panel having more upward arch then the original, everything there seemed to fit okay. Here is what I did on my floor boards. The horizontal board is 11 1/4" wide and the over all width of the top board is 5 1/2" and the middle board is 8 1/2" plus a 30 degree bevel on the bottom side. Made then out of local Oregon White Oak that I milled about 20 years ago. A spline was added in the horizontal board but only glued in the middle 1/3 of the board to allow for some movement due to different moisture conditions. You have misread or have inaccurate plans. The bottom board, #4 in your first post should be attached to #3, #3 should not be attached to #2. The hand lever cutout should extend into #3. The angle cut to join #4 and #3 should be the same to mate properly. Take a closer look at Dan Treace's posting and you can see what I am saying. Floorboards were originally painted black. I have the Ford factory drawings so send me a private message and I can answer more off line. The plans that I have are shown in the sketch at the top of this thread. Yes, I may have to extend the opening forward for the hand brake lever and will check that when I get the body mounted on the frame. Mine are more like the "authentic" reproduction ones sold by the vendors. Not sure I understand your desire to make wrong when the correct info is available, but here are a couple of things to consider. 1) the hand brake will not fully release due to no cutout on board #3. This will limit you to two gears, low speed and reverse. 2) Board #4 without #3 attached to it will not have the necessary strength to allow you to step on it anywhere to the right of the hand lever cutout. You can expect the board to break along the wood grain at the rear most end of the hand lever cutout just forward of the radius. Henry Ford was clever, he had 17 years to get it right by the time your car was manufactured in 1926. It is easy to assume that we can do better today with modern methods and materials, but they were designed that way to find the optimum intersection of performance, manufacturability, and cost. You obviously have a great deal of woodworking talent and they look real purty, thanks for sharing.